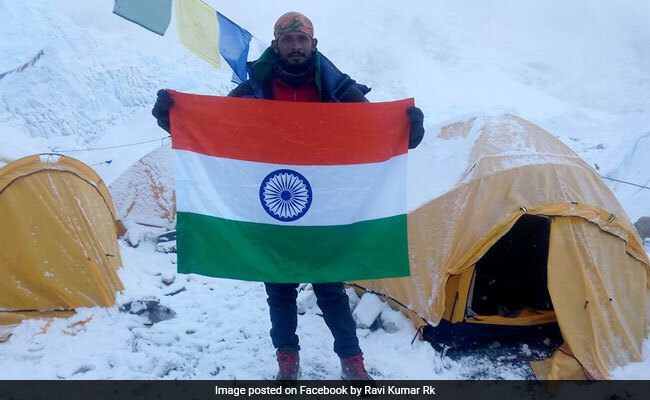 Ravi Kumar, 27, from Moradabad of Uttar Pradesh on Saturday lost contact with the balcony area, the final resting spot before climbers ascend the south summit of the mountain. Ravi Kumar successfully climbed the 8,848 meters high Mount Everest at 1:28 pm on Saturday. Kathmandu: Hopes of finding an Indian climber, who went missing on Mount Everest, slimmed today as the crucial 24 hour period since his disappearance has passed, a mountaineering official said. Mr Kumar successfully climbed the 8,848 meters high Mount Everest at 1:28 pm on Saturday. His climbing guide Lakpa Wongya Sherpa has also been found unconscious after suffering from frostbite at Camp IV. Mr Kumar and the climbing guide got separated during the descent. "The chances of his survival are slim, as more than 24 hours have elapsed since he went missing in the extreme climate," Ang Tshering Sherpa, president of Nepal Mountaineering Association. At least five climbers have died on Everest during the current spring climbing season. An American and a Slovakian died near the summit of the world's highest peak yesterday. Nepal has cleared 371 mountaineers to climb Mount Everest during the current season ending this month.